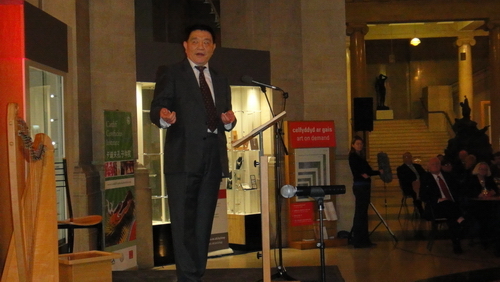 On the evening of January 25, 2011 in Cardiff, a city well-known for vocal music, the hall of the National Museum Wales is gorgeously decorated with bright-coloured Chinese red lanterns and Chinese knots, adding to the entire Museum a strong atmosphere of the Chinese New Year. 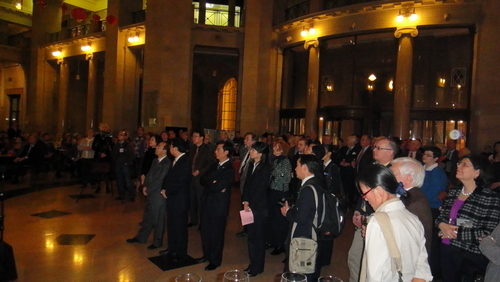 Here the Opening Ceremony of the Exhibition "From Steep Hillsides: Ancient Rock Carvings from Dazu, China" is held. The Ceremony is attended by over 300 celebrities from all walks of life in Wales, London and other parts of Britain, including the First Minister of Wales Carwyn Jones, Welsh Minister for Heritage Alun Ffred Jones and representative from British Council Andrea Rose as well as Mr. Wu Xun, Minister Counsellor for Culture of the Chinese Embassy in the UK and the delegation from Chongqing Government. Chinese dances are performed at the ceremony by students of the local Chinese schools. This is the first time for Dazu rock carvings to be exhibited outside China. The 48 exhibited large-scale cultural relics came into being in the Song Dynasty and most of them are grade 1 or grade 2 national cultural relics, and there are also 4 groups of replicas of the most famous sculptures of Dazu rock carvings. The exhibited national treasures are largely the top cultural relics put in the collection of the Dazu Rock Carving Museum after falling due to natural weathering from the rock walls in which they were originally carved. First built in the Tang Dynasty, Dazu rock carvings comprise over 50,000 statues in total, forming one of the world's largest Buddhist grottoes. In 1999, the carvings were included in the World Cultural Heritage List. Mr. Carwyn Jones, the Welsh Assembly Governments' First Minister, commended the exhibition in his speech. He says that Wales is greatly honoured to be the first place outside China to exhibit Dazu rock carvings. Minister Counsellor Wu Xun said in his speech that Dazu is a less developed county in Southwest China, and that today's exhibition in the UK of the peerless rock carvings from that county reflects China's extent of opening-up and broadmindedness. He also briefed the guests on the achievements in cultural development during the eleventh Five-Year Plan period, the prospects of the cultural development during the twelfth Five-Year Plan period and the guidelines and policies of China on cultural exchanges with foreign countries, receiving rounds of applause from the audience..
Mr. Zhou Bo, Head of the Dazu County, said at the event that it is the first time in a millennium that Dazu stone carvings go abroad to the "town of castles" on exhibition in the National Museum of Wales, the most unique one among the British museums, to show the friendly British people their unique style. This can be considered as a handshake of civilisations across a thousand of years. The exhibition will last until April.